SOUR POWER® BULK BELTS ARE NOW AVAILABLE IN WILD CHERRY! 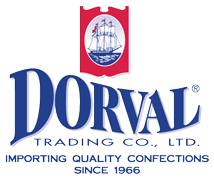 Dorval Trading Co., Ltd. is very excited to be adding a new flavor to its already popular SOUR POWER® Bulk Belt category. The new WILD CHERRY flavor joins the already existing flavors of Pink Lemonade, Quattro®, Strawberry/Apple, Berry/Blue, Strawberry/Banana, Raspberry/Cherry, Strawberry, Green Apple, and Watermelon. Each bulk case is packed with 3×6.6 lb. units. The launching of this new lip-smacking flavor, WILD CHERRY, is thrilling to us as we expand the ever popular SOUR POWER® Brand. This product is available now! STEP RIGHT UP! COTTON CANDY IS HERE! COTTON CANDY is the newest flavor profile in the SOUR POWER® Straw Packages Line! Dorval Trading Co., Ltd. is pleased to announce the introduction of COTTON CANDY Straw Packages. COTTON CANDY will be joining the other existing flavors and growing line of Straw Packages including Pink Lemonade, Blue Raspberry, Watermelon, Strawberry, Green Apple and Sour Power Sortz®. This new product is ready to ship now! SOUR POWER® COTTON CANDY Straw Packages are a mixed package of pink and blue straws and taste just like the COTTON CANDY adults and kids love to remember. The packaging is playful and fun, with a Big-Top Circus theme. The eye-catching design will be sure to draw the attention of SOUR POWER® lovers everywhere! The COTTON CANDY Straw Packages are packed in 24ct display boxes, making it a great visual item for every shelf!